a deep love for music. This shared love brought 32 million of us together at various US festivals in 2014. That stat alone proves music has a powerful effect on us. Can you imagine going to a festival with no music? I’m pretty sure it would feel like something was missing, and I don’t think I want to test that theory. In addition to driving us to buy festival tickets, music has been proven to “affect the autonomic nervous system (in terms of a faster recovery).” This means we can recover from stressful situations more quickly if we start by listening to music. You probably didn’t need another reason to love music, but now you have one and it’s based on science! For people like us who are addicted to music, it makes sense that we’d be open to seeking out auditory experiences wherever we can find them. It’s been described as “kindergarten naptime for grown ups” by the creators of one of the more famous spots to get your soak on, the Integratron. There’s no water here, only a submersion into a complete auditory experience like no other. 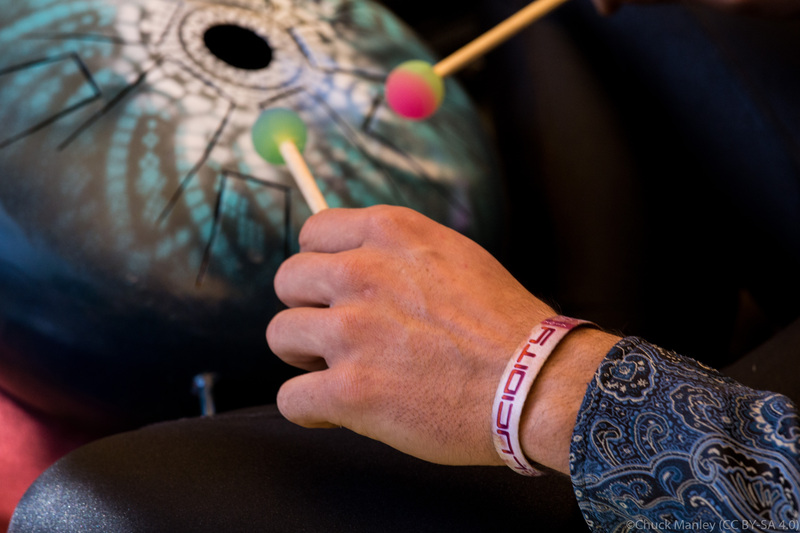 A sound bath consists of laying on a mat, typically with blankets and pillows, while a sound practitioner plays instruments that create various frequencies. These instruments can include quartz crystal singing bowls, gongs, tuning forks, and tibetan singing bowls. A typical bath lasts for 60 minutes, although it could be as short as 15 or as long as 90. Unfortunately, we don’t yet have scientific studies to back up the positive benefits of a sound bath. I’ll spend the rest of this article sharing my personal experiences with you. Since every person seems to have a unique experience, I encourage you to try one at Lucidity Festival! Spirit Metacine has been known to offer sound healing workshops, also keep an eye out for The Breathwork Sound Bath (with Guy Douglas, Xenia Giolli, Emile Janse). Check the workshop schedule and look for the gongs and singing bowls. I’ve attended two sound baths at my favorite local yoga studio in SLO, Spark Yoga. The baths were performed by Original Frequency, a group based in Los Osos, CA. Sound baths are often held in yoga studios because of the shared philosophy in the benefits of focusing inward and seeking peace and relaxation. Friends have come with me and their reactions vary from extreme relaxation to feeling like a new person. I relate the benefits of a sound bath to those of meditation or yoga. It’s an opportunity to put my phone down, look inward, and truly take some time for myself. 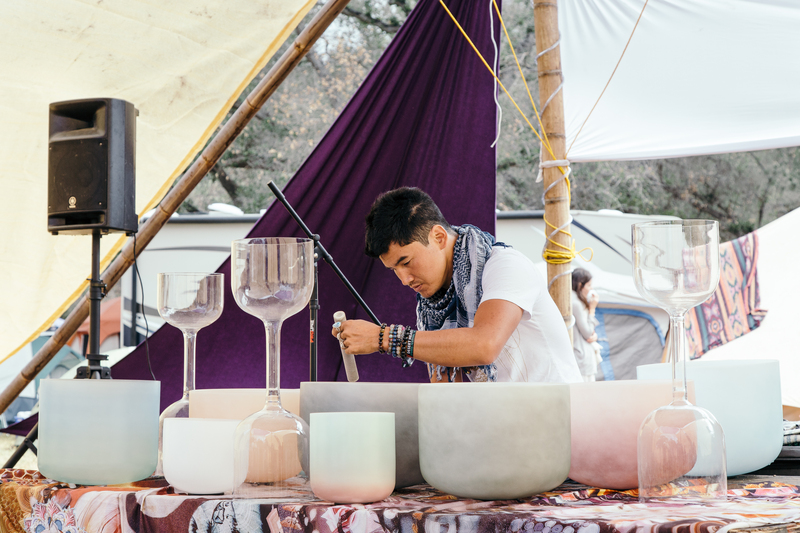 My first sound bath was at Lightning in a Bottle in 2016. I joined 20 people inside a canvas tent. We were surrounded by 10 gongs of various sizes. I wasn’t sure what to expect, so I put on my festival mindset and forced myself to let go of expectations. I listened to the gongs and let my mind go wherever it wanted. I had recently been through a difficult breakup and my mind wandered there a few times, but not without hesitation. I didn’t want to let my weekend be overrun with negative thoughts, yet I knew there were feelings I needed to let out. By the end of the bath, I came to a peaceful headspace knowing that I was doing something I wanted to do and it felt good. I walked out of the tent, looked at my friend, and started sobbing. I think this goes to show that not every sound bath will leave you with warm fuzzies, but every bath will give you a few minutes to let go and just be with yourself. I recently traveled to the Integratron in Joshua Tree with some of my closest friends to experience pure unadulterated sound healing. Their sound baths are held in a building made entirely of wood, with a ceiling that’s perfectly domed so the waves bounce from the bowls up to the ceiling, then back down to the bathers. The bath started with a warning that we might be tempted to fall asleep, but we should avoid it because the sound of snoring can travel in the same way as the sound of the bowls. I was struck with fear as I realized I was pretty exhausted from my drive down to Joshua Tree, and the blanket was pretty comfortable. I held strong for the first 10 minutes, then felt extreme guilt when my neighbor tapped me to wake me up. I’ll make sure to drink tea before my next adventure. Lucidity is leading the pack in the practice of sound bathing. We even had a picture featured in this article from Quartz. Just like how yoga became a popular form of exercise in the ‘80s, sound baths are now gaining momentum. 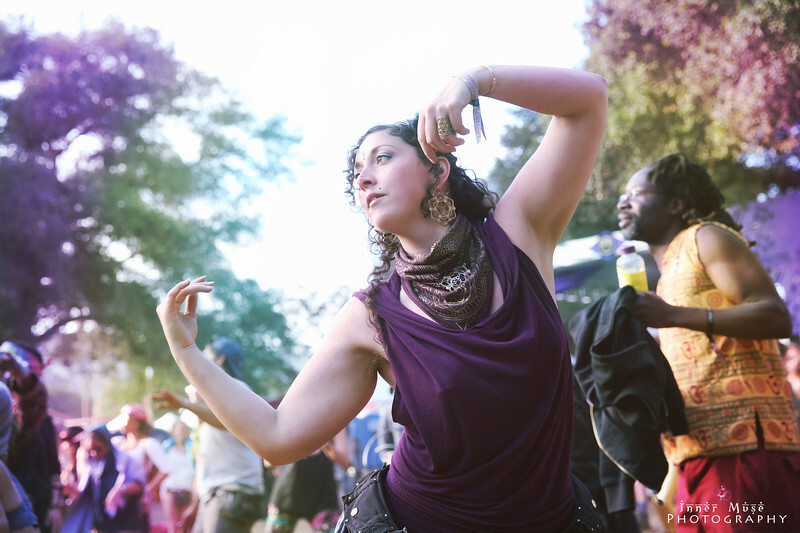 So take a few moments to check out sound healing when you’re at Lucidity in April. I’ll definitely be stopping by to say hi, have some tea, and slip into a bath.